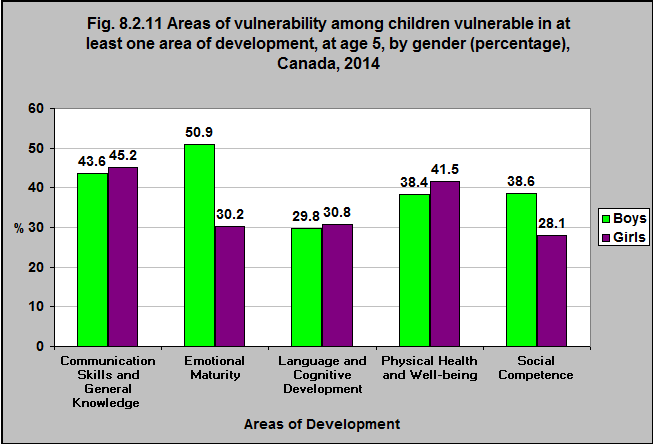 Boys are more likely than girls to be vulnerable in the Early Development Instrument (EDI)* domain areas of emotional maturity and social competence. The Emotional Maturity domain includes the ability to think before acting, a balance between being too fearful and too impulsive, an ability to deal with feelings at the age-appropriate level, and empathetic response to other people’s feelings. The Social Competence domain includes curiosity about the world, eagerness to try new experiences, knowledge of standards of acceptable public behaviour, ability to control own behaviour, appropriate respect for adult authority, cooperation with others, following rules, and ability to play and work with other children.